Exemplary Online Instruction application period is OPEN! Please see http://www.csuchico.edu/eoi/ for details. Our annual Exemplary Online Instruction (EOI) award application period is open, and we have a newly revised website. We are using the QOLT instrument from the CSU Quality Assurance (QA) Program, rather than our previous used instrument the Rubric for Online Instruction (ROI). The CSU is offering a QOLT award recognition program for the top few courses in the CSU. Chico offers the Exemplary Online Instruction Award locally on our own campus. Please feel free to contact QA Coordinator, Ben Seipel; or CELT Director, Kate McCarthy; or TLP manager, Laura Sederberg who are all involved with this program. The deadline for applications is May 15, 2015. Thanks for your participation! Affordable Learning Solutions (AL$) is a CSU program to help save students money by looking at alternatives to the high cost of textbooks. At Chico State we call it CALS, and our yearly project to do so (TAP) just received $20,000 to work with Chico State faculty to reduce costs to students for the 2015-16 academic year. Textbook Alternatives Project (TAP) is in its third year of providing alternative choices and support to accomplish changes in one course of your choosing. It has a simple goal = save students money! Applications are now available for TAP, year three (or TAP3). Find the application packet online, http://www.csuchico.edu/cals/tap/index.shtml. Be sure to look over the website and see the year one and year two projects for TAP. If you have questions about the process or application, you may contact Laura Sederberg (Manager of TLP) who coordinates this project with the CSU. Faculty Learning Community is formed for each year’s cohort and we bring in guest speakers, faculty librarians, instructional technology consultants, bookstore representatives, and members from CELT to help you think through what you would like to accomplish to save your students money. Applications are due by September 11, 2015, submit to Laura Sederberg in TLP, zip 005. Those of you willing to write your own textbook or other online resources may decide to try producing them with assistance from an application called SoftChalk. It helps you author materials that can then be put into Blackboard Learn rather easily. You may choose to build your own e-Book, or other Open Education Resources (OER). For questions, contact Laura Sederberg, manager of the Technology and Learning Program (TLP), by phone 898-4326 or campus email. There is no longer a link to the Notifications module page on the default Bb Learn course template automatically created for you at the beginning of the each term/semester. To simplify the default course template since the same information can also be found on the Bb Learn Home page. Feedback from faculty indicates the “What’s New” module contained too much distracting information at the beginning of the semester. Faculty are planning to assemble their course(s) from scratch using the default template. Course copy is not impacted. 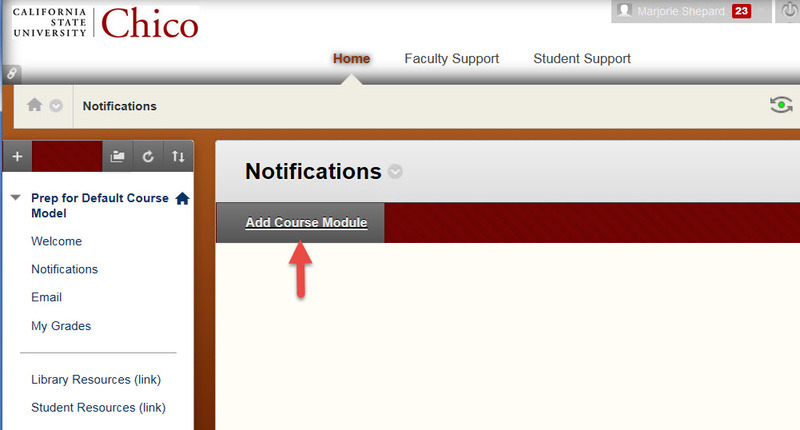 If you have a Notifications page on the previous semester’s course, it will come over during Course Copy. How can I add the Notifications module page back on my course menu? 1. Select (+) above the course menu, and select Module Page. 2. Enter Notifications as the name. 3. Select Available to Users and click Submit. 4. Click Add Course Module. 5. Click Add next to the modules you want displayed (previously these were My Announcements & What’s New).